The issue: Your smartphone or desktop computer is not built from scratch by Apple or Dell. It includes parts made by subcontractors. But one sole subcontractor does not make every chip inside; that task is handled by yet another subcontractor, who may buy the needed tantalum from still another supplier who may have purchased the tantalum ore from a militia leader who forces children to work in dangerous mines in the Democratic Republic of Congo (DRC). 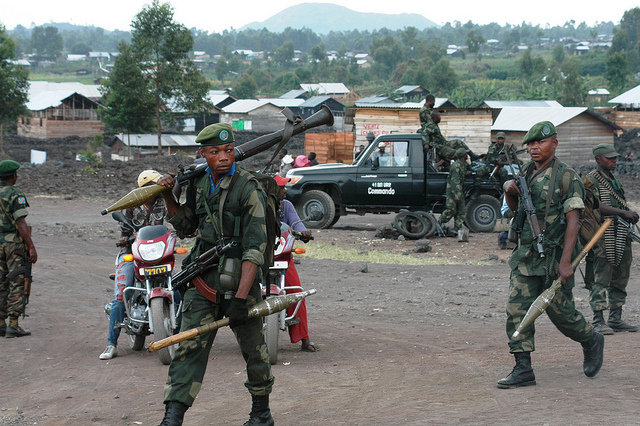 Fighting in the DRC has killed over 5 million people since 1998, according to the International Rescue Committee. It is the world’s bloodiest conflict since World War II. As globalized supply chains erode borders, the ideals of social responsibility are expanding globally, with corporations now expected to certify their suppliers’ labor practices. Since the Dodd-Frank Wall Street Reform and Consumer Protection Act of 2010, American law has required publicly traded companies to detail their sources of so-called “conflict minerals” — tungsten, tantalum, tin and gold (known as 3TG), which are found in most modern electronics and in jewelry, cars, airplanes and more. The federal law requires companies to file annual due diligence reports to the U.S. Securities and Exchanges Commission (SEC), but does not mandate that companies stop sourcing these minerals from conflicts. Under Dodd-Frank, companies are obliged to assess if they could be directly or indirectly financing armed groups in the DRC and nine neighboring countries — Angola, Burundi, Central African Republic, Republic of the Congo, Rwanda, Sudan, Tanzania, Uganda and Zambia. An academic study worth reading: “Challenges for Global Supply Chain Sustainability: Evidence from Conflict Minerals Reports,” published in the Academy of Management Journal, July 2016. Study summary: Researchers from the University of Michigan analyzed all the due diligence reports the SEC received in 2014 and 2015 — about 1,300 reports per year. They also looked at other SEC data and business metrics to “analyze the organizational factors associated with supply chain visibility.” They assessed companies’ organizational complexity, leverage over its suppliers, the intricacy of the supply chain and its public profile. The authors searched for patterns that distinguish firms that can and those that cannot certify their supply chain free of conflict minerals. Almost 80 percent of firms were unable to determine the sources of the minerals in their products (79 percent in 2015; 77 percent in 2014). Most firms cited “the complexity and size of our supply chain” as the main reason they could not identify the source of their minerals. Many noted that they could not because their own suppliers were not required to provide such a level of certification. Companies with more suppliers found it harder to declare their products conflict free. Internationally diversified firms found it harder to verify sourcing: “Companies that had foreign subsidiaries across many countries were 29 percent less likely to have reason to believe their products to be conflict-free” than companies with smaller global footprints. A company’s commitment to environmental or social issues is not a factor in how able it is to certify its products free of conflict minerals. Throwing money at due diligence does not statistically improve the chances of verifying the supply chain as conflict-free. To see what a company has filed, use the Securities and Exchange Commission’s EDGAR (electronic, data gathering, analysis and retrieval) database. If a company is publicly traded — meaning, its shares are bought and sold on a stock market — it must file extensive documentation with the SEC, the U.S. government body tasked with overseeing capital markets, ensuring transparency and protecting investors against fraud. The SEC provides registration information, financial statements and other documents through EDGAR. After finding the company, search the list of documents. Look for a filing called “SD” (which stands for “specialized disclosure”). Let’s look at Intel Corporation. Other NGOs work on the sourcing of raw materials, including African diamonds and Uzbekistan’s cotton crop, which is harvested by school children and their teachers, who are forced out of the classroom each fall, according to Human Rights Watch. A 2015 study published in the Journal of Business Ethics looks at how companies are implementing supply chain due diligence. A 2015 fact sheet from the U.S. Geological Survey describes the gold supply chain in the DRC. A 2015 paper in the Journal of Human Rights places Dodd-Frank in the context of other efforts to shrink international black markets. Citation: Kim, Yong H.; Davis, Gerald, F. “Challenges for Global Supply Chain Sustainability: Evidence from Conflict Minerals Reports,” Academy of Management Journal, July 2016. doi: 10.5465/amj.2015.0770.